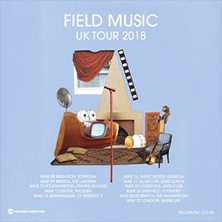 Field Music – the brothers Peter and David Brewis – make gloriously intricate rock music; with infectious melodies dovetailing across multiple time signatures complemented by the warm Mackem twang of either brother’s voice. Their five albums as Field Music, including the Mercury-nominated Plumb and 2016’s Commontime , and numerous solo records, collaborations and film scores have received massive critical acclaim and an eclectic mix of celebrity fans, from Prince to Vic Reeves. Page generated in 0,074853 seconds.